When one reads the plot description of Warrior, the film sounds like a Hallmark channel TV movie of the week. Two men fight in the ultimate MMA tournament for different reasons: one needs the prize money to pay off his debt incurred by a sick daughter. The other hopes to give his winnings to the widow of his fallen Marine comrade. Oh, and the two contestants are brothers. Long lost brothers, to boot. Fortunately the film has Joel Edgerton and Tom Hardy playing the leads, giving 3-dimensional characters to this utterly 2-dimensional script. Hardy and Edgerton deliver star-turning performances here. Edgerton portrays a humble, down-on-his-luck, thoughtful man. Hardy portrays a coiled, angry beast that shimmers under a calm surface. The pair don’t meet on screen until the picture is half over (and when they do it’s electrifying), but both men get to play off Nick Nolte as their alcoholic, repentant father. The three actors tread lightly with their character-work, making up for the script’s heavy handed manipulation. Field of Dreams has garnered a reputation for making men sob and reflect on the relationship they have with their fathers. Warrior will make men cry and reflect on their relationship with their brothers. The films ends on a note that surely reads as maudlin but thanks to the actors and supportive direction by Gavin O’Connor the audience will surely be moved. Warrior isn’t a great film, but it is a very good one. Solid, but not flashy. I wouldn’t recommend seeing it in theaters, but now that it’s out on BluRay and DVD the film is certainly worth adding to your Netflix Queue or renting from your local RedBox. Every once in a while we need a “good-one-of-those”, and Warrior is a “good-one-of-those” in the highest order. 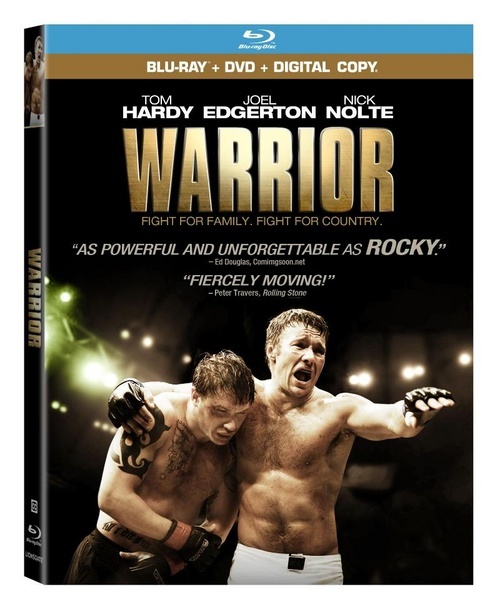 You can order Warrior on BluRay and DVD here. There are currently 1 Comment on BluRay Review: “Warrior”. Perhaps you would like to add one of your own?